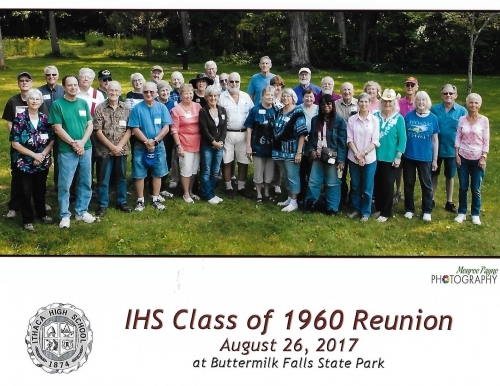 Welcome to the Ithaca High School Class of 1960's website. We encourage you to visit this site frequently for updates and to add your own touch to this endeavor. Your active participation will make the site much more meaningful. It is with sorrow that we announce that Ann Atwood Woodruff passed away on March 27, 2019, in Los Angeles, California. Her brother, Richard, advised us that the family will be gathering soon to discuss memorial plans in Ann's memory. He would appreciate hearing from Ann's high school friends who might want to share memories of their high school years with Ann. 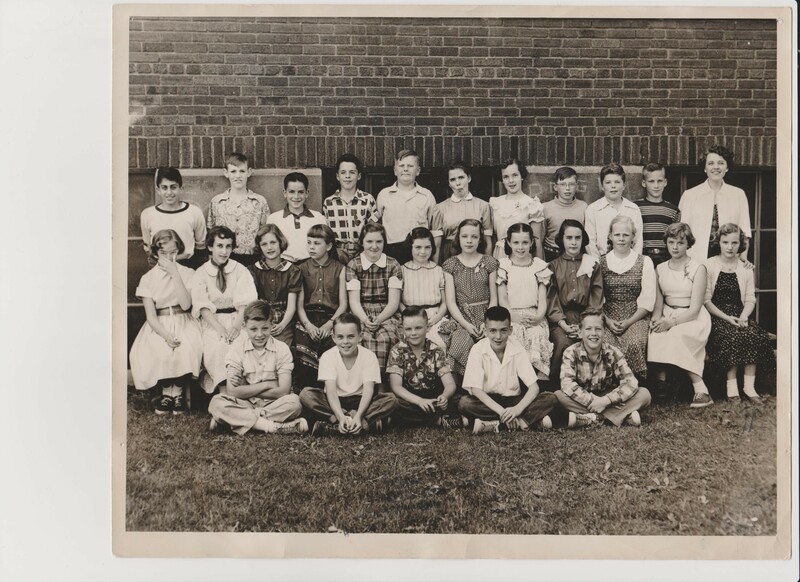 You may post your expressions on our Class of 1960 Facebook page. We'll relay these to him. After graduating from Cornell University, Ann taught French at the Westminister School, in Atlanta, Georgia. Before marrying, and moving to Berkeley, Caifornia, Ann also worked for the Rockefeller Foundation, in New York City. Ann is survived by her brother Richard, sister Phoebe and children Will Rollins and Hadley Woodruff. Our condolences go out to her family during this difficult time. We will update this site as further details become available. In response to the recent class mailing, we learned that Peter Loberg passed away on April 20, 2013. Our deepest condolences go out to the Loberg family. South Bristol, NY: April 20, 2013 at age 70.Predeceased by his parents Professor Harry and Aileen Loberg, he is survived by his loving wife, Jeanne, his children, Janine (Russell) Dryden of Sunnyvale CA, Dr. Eric R. Loberg of Seattle WA, his grandchildren Casey, Claire and Julia Dryden and Kayana and Kalina Loberg, his brothers Paul (Lynda) Loberg of Cincinnati OH and Park City UT, Hon. Harry (Susan) Loberg of Santa Barbara, CA and Dr. Eric (Mary) Loberg of Los Angeles, CA, his brother-in-law and sister-in-law Dominic and Jacqueline Angelone of Brooklyn, NY, several nieces and two nephews and many loving friends. Pete was a graduate of Cornell University School of Engineering. Upon his graduation he accepted a position with Eastman Kodak Company whereupon he was drafted to serve in the Viet Nam War. He enlisted in the United States Navy and was selected to serve with the Civil Engineer Corps, Battalion Eight of the US Naval Seabees as a Lieutenant Junior Grade Officer, completing three tours in Viet Nam. Upon completion of his four-year tour of duty, he went on to serve ten years as a Lieutenant in the US Naval Reserve. Pete was an avid sailor, as his many sailing trophies will attest. He was a Founder and Past Commodore of the Pultneyville Yacht Club, a Founder and Past Commodore of the Clayton Yacht Club, a past member of the Rochester Yacht Club and a past member of the Canandaigua Yacht Club. Pete was active in the Rochester Power Squadron where for many years he taught the Piloting and Navigation Course. Pete served as the Director of Operations at the Rochester LPGA for a number of years representing the Honeoye Falls/Mendon Rotary Club of which he was a member and Past President. He was employed by Eastman Kodak Company for thirty-five years retiring as the Manager of the Utilities Organization. He then went on to serve as the General Manager of Rochester District Heating Co-operative for ten years. Upon his retirement, Pete served as a substitute teacher in the Naples Central School District and as a substitute mail carrier at the Naples Post Office - both of which he highly enjoyed. Pete was a member of the Mendon Conservation League and a Lifetime Member of the South Bristol Fish and Game Club. The family wishes to express their appreciation to Dr. E. A. Blair for his compassion and kindness, the staff at the Sands Cancer Center, the staff at F. F. Thompson Hospital and the amazing and loving personnel at Hospeace House. Karen Lindstrom notified Phyllis that Carl J. Marshall, Newfield, NY, passed away January 24. It is believed that the cause of death was from complications of diabetes and cancer. Details of arrangements will be added once they are published. Our deepest condolences go out to Carl's many friends and family. Hello fellow classmates! It's about time we chatted a bit. 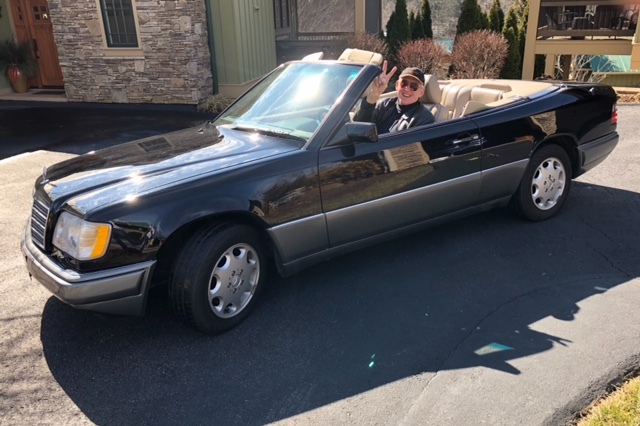 Since arriving back south from Christmas vacation (to see Larry and the kids), Steve and I have awakened thoughts of our next reunions, that have been on the back burner. 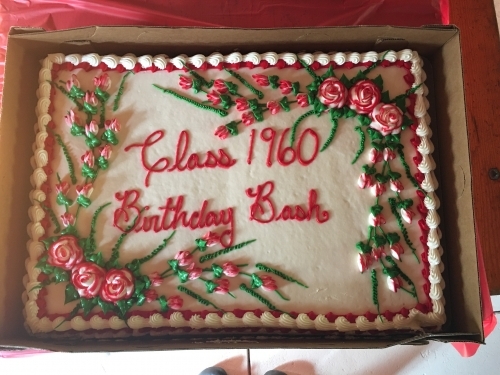 Our 60th reunion and our 80th birthday celebration are now on the front burner and warming -- with you in mind. Save the dates for two more parties! 80th Birthday Party in Ithaca, NY -- August 4-7 or 11-14, 2022. For the 60th, we've met with The Waterfront Inn and The Villages Guest Services people. Ideas are taking shape, and we think this is what our 60th might look like for you: From Thursday afternoon through Sunday morning, a variety of activities to choose from -- always ending the day with our "family" sitting down together for dinner -- as families did in days of old. Yes, we are cognizant of our limitations, so all levels of activities from sitting and chatting to moving and grooving will be up for grabs. Arrive back home feeling restored, rich in friendships, with memories to treasure. If traveling alone is a challenge now, we invite you to find a younger relative or friend to accompany you. They are very welcome to join us, explore The Villages on their own, or drop you at the hotel and carry on with a vacation of their own. It's been done before, and seemed to be a great solution. Each activity will be identified with reference to cost, if any, and level of difficulty. Steve and I, like you, value our connectivity in a deeper sense each year. Thank you for sharing your passions and your concerns through email and Facebook. Occasionally, we find comfort by sharing with just one classmate who understands, and if you choose either Steve or Phyllis, we know the importance of confidentiality. We heard your request to return to The Villages, and we heard your call for a return to your home town, so we are returning to Ithaca for our 80th birthday in 2022. We hope you can attend one, or preferably both parties. As time for these parties gets closer, if it appears you will not be able to attend either, your classmates remain interested in you, and your welfare. It's then that communication becomes our best friend. We're nice people, getting mellower and more caring all the time in fact! We have common interests, encouragement to offer, and new ventures to incite in you, if you are interested. 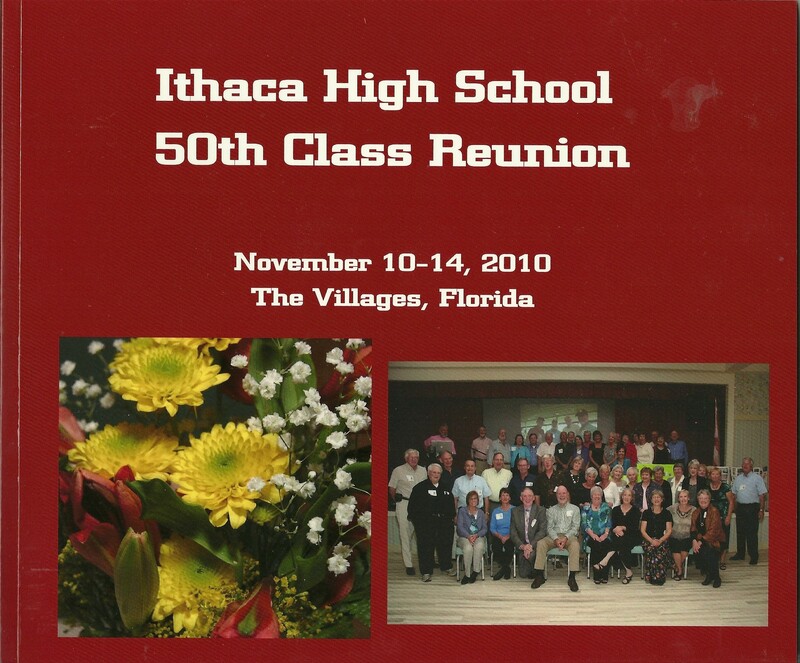 Despite our slower motion, we carry on, because our legacy as the Ithaca High School Class of 1960 is not yet complete. We have so much to offer to ourselves, our families, and our classmates. Please engage in our friendship. Just a little trivia-- of the 452 who graduated with us, 99 have passed away (24%), 176 receive communication by email, another 107 get word by surface mail, and the rest are still alive as far as we know, but mail sent to last known address has been returned to us, or in some cases, our sleuth Steve Beaulieu has not ever been able to locate them, despite his best effort. Any help from you is appreciated, giving honor to one's wishes for privacy of course. We accept that some wish to be remembered only in our minds. But how excited some are when we do find them! See our "lost contacts" list on page 4 of the mailing. Directories are available at each reunion or birthday party and also available by mail upon request once each revision is complete. The directory comes in an "IHS Red" binder, with address, email, and phone number for each classmate, under their yearbook picture. Classmate Profiles, a link on www.ithaca1960.com is another source for connecting with classmates, and we encourage 100% participation in adding your profile, or updating what's already there. Stay tuned to mail and web for further details, and save the dates now. Email or write or call Phyllis any time you have a change in contact information. Until we meet again, be in good spirits, always seeking purpose and strength, believing you are value added to our class. 1. Are there any changes in your contact information (postal address, email, phone)? If so, please call or text to 518-421-6726 (Phyllis). 2. If you have trouble responding, is there a person you could assign to intervene for you and respond on your behalf? 4. This reunion is being put together by volunteers. Are there areas that you might be able to assist us with to make this even better? Not everything has to be done in The Villages. Each of us has something unique to contribute toward making this a memorable reunion. The more involvement the better. What would you be willing to help with? - in the planning stages ______________________________________________________ or On that weekend ______________________________________________ . 5. Are there points we are missing that we should be addressing in our planning? 6. Please review page 4. If you can help find the lost, send information. We?ll verify. Allen John D Mignano Anthony Camillus ? Aramini Harrison Marilyn Pete Jackson Dolores Cape Coral ? Brown Hoffmire Norma / Gary Schilling Gary R Ithaca ? Crofoot Mary Simpson Robert Melbourne ? Mack (John) Alan Plano, TX ? Martin Crispell Donna Freeville ? Masters Wander Carol Fairport ? Mary D'Alessandro-Gilmore and Frank Gilmore with their golden retriever, Elyse. Phyllis McLaren, as many of you know, spends part of her year in the Albany area. She recently ran across an article, in the home section of the Schenectady Daily Gazette, featuring Frank Gilmore and his wife Mary D'Alessandro-Gilmore and their residence. The full article, that appeared on September 27, 2018, can be found on the Gazette's web site: www.dailygazette.com. Frank is a partner at SRG Architects in Schenectady. “The History Center’s Carl Koski Photograph Collection. Our photo collection is named for Carl Koski, long-time photographer and museum technician who retired recently after almost half a century of service to The History Center. Carl began working for us in 1970 when we were still the DeWitt Historical Society and resided in the old Courthouse. Carl leaves behind signs of his skillful hand throughout The History Center. The engaging Familiar Faces display – Carl reproduced the photographs and built the walls. Exhibits too numerous to name had components of all kinds hand-built or installed by Carl over the decades. He was tremendously versatile, putting his hand to many things, including care of the Eightsquare and all things technical. He was involved in the production of many of our published books, providing his beautiful photographic work for Images of Rural Life, A Short History of Tompkins County, The Towns of Tompkins County, and Ithaca’s Neighborhoods, to name just a few. Carl’s prints of our historic images were sold and hung in exhibits and homes by the thousands over the years. A painstaking artist, Carl mastered the old-fashioned darkroom techniques that brought out the depth and subtlety of 100-year-old glass plate negatives as well as faded and aging prints. His talent transferred easily and seamlessly to digital work when the new technology took over and his reproductions are as beautiful as ever. Greetings from your IHS communication center! Steve Beaulieu and I march to the beat of keeping our class connected. Perhaps you, like I, find challenge in writing to people you haven’t seen in way too long, searching for a comfortable break through into sincere discourse. Invite your classmates into your world. Share a joy you have had. Or … Do you wake each morning feeling like no one understands your plight? We’re pretty good listeners. Try us. Not everyone is having ‘a great day’ today. We know that. Are you finding the days moving by so fast they create a feeling of urgency trying to ‘fit it all in’ while you can? You may have a bunch of unfinished business; I don’t mean cleaning closets or settling financial affairs (although quite important), but exploring new interests, tapping into the knowledge base you initiated at Ithaca High School. I’m still adding to my bucket list, and I pray daily for guidance on prioritizing. You know too well the condition of my heart when I have to send out another email telling that a classmate’s days on earth are complete. I read the obit and find myself wishing I had known them better before they departed. Reunions allow for that. And our website! Steve will tell you how many hits we get each month, and over the year. Facebook friends keep relationships fluid and current. Writing has surfaced to the top on my bucket list and yes, with memory loss running ramped in my family, there is urgency! So as I begin to author my first book, I reached out to a classmate who knows something about the journey an author will take. I can’t say I remember Don Berk from our days at Ithaca High School. But when we visited at the 50th reunion, I learned he was a published author and I remembered that this summer. Our emails back and forth have done much more than advise and encourage. His advice has been spot on, and I am applying that. But more than that, I have learned that Don is doing some great things in his life. He’s working with young people and shares their excitement in their self-discovery. Teaching 13 year olds to fly a glider! Building self confidence that will charge their batteries for a lifetime. Reach out, any way you feel comfortable. Make it personal, and real. Yes, I’m talking to myself as well. I imagine Terry Cullen is rounding up another winning team for Cornell football by now. Dave Banfield is no doubt busy keeping the parks in shape for hikers like us. I hear from JB Graves once in a while and it’s always ‘no bad days’ with him. Rosemary Gates Campos has been actively reaching out to those in her area of California, modeling this practice for all of us. You’re great Rosemary! Barbie Bennett is just one of our own who have had some health issues this year. She is in recovery. Also Kathleen Muzzy LaMorte, and Dorothy Griffith Sonnichsen. How are you doing? Reading some old journals the other day, I knew I had to pick up the phone and call Jan Murphy Ivkovich. “I just read that 15 years ago in 2003, I was sitting on your deck having toast smothered in current jelly you had made! Thank you all over again!” This memory caused Jan to pause and reflect on her dad and his current bushes, now mowed over, but appreciated anew. Doug Hughes and his wife have repeatedly invited classmates to come see them! A boat ride with grilled food to boot! I keep flying over North Carolina as I go from my life in Florida to the country and back. Doug, is it too late? What can I bring for dessert? Southern folk like lots of sugar and I do too! Alison MacLeod- I know there must be something new and exciting going on for you. Sandy Sortman Raponi is wondering when we shall meet again. Judy Mitchell Knuutila and I, though miles apart, have re-opened our Monarch butterfly nurseries for 2018. My hayfield, and also the south garden, have milk weed plants worthy of inspection. Find a caterpillar, bring it home riding on the milk weed leaves it loves, and place all that in a glass jar with netting covering it. A rubber band will keep our friend from escaping. Larry and I traveled this past weekend and allowed three people to adopt the cocoons we took with us. So today we found some more and are in business again. I see the newest one has a big appetite and even though it’s raining and I’ll don my pink camouflage boots and go get more milk weed for its dinner. I hope you have the thrill of releasing a butterfly, watching it fly (mostly in circles) for the very first time in its life, and then take off on a long flight to Mexico! JB will care for them and send them back next summer. Dave Wilson knows how to fly. He’s all over the place, and shares his adventures freely. As does Ron Winchell. Richard Owlett is working on pictures for us. Some of you have asked about our next gathering. When, where, and did I miss it? Read your web site and your surface mail or email and you will not miss it! Just take care of yourself and we’ll see you in 2020. If circumstances limit your travel, you are not alone, but don’t hesitate to find someone to communicate with whom you’ve lost touch with. Help us bring them back into the fold. Directories, newly revised, are available at every reunion, and by mail for $9, upon request; Don’t wait. We are 75, or maybe 76. Be grateful, be available. This is a good promotion for those profiles found on the web site, just one of the site’s best features. Steve is changing the menu listing from “Class Directory” to “Classmate Profiles”. Some have been confused and thought - if no profile, they must have either passed away or been forgotten. We don’t forget people! We do want to know how you are doing. Do not feel like you are writing a resume to be memorialized, but do tell us what tickles your fancy these days. If already entered, revise it and date it. If new and need help, let me or Steve assist you. Ask someone to take a picture of that 2018 face. We’re all well-seasoned and beautiful in our wisdom. But who are you today on the inside, really? I encourage you to be an ambassador for the class like Rosemary Gates Campos, Don Berk, and Al Simons have done. If we each reach out to a long lost friend, we will touch lives and bring wholeness to an already amazing group of friends. The next letter / email will be out in November. For now, Steve and I send our best wishes and wait expectantly for any news you have to share. As always, if you change your address, your e-address, or your phone, let me know so I can update the directory for our next publication. Some have been confused and thought - if no profile, they must have either passed away or been forgotten. We don’t forget people! "With concern and sympathy we face what people have faced since before Abraham. The worst thing for us remaining is loss of communication. The finality of death is what bothers us. Remember when everybody you knew was getting married? Then having children? There were waves of those occasions, almost a flood sometimes. Now we are in a different era personally. Normal life spans are being reached. My grandfather railed about everybody he knew gone; nobody to talk with (about neighbors’ fine horses or plowing with mules and oxen, at least). My mother died at age 102 and she complained about nobody with whom to converse about life and memories common to her peers all her life. Reminiscing with people who were the age of her retired children was not the same or satisfactory. We who worked out at the local YMCA during noontimes of our working lives asked each other, “Would you like to be made younger by 30 (or later, 40) years?” Everybody in the locker room gave the same answer: “Not if you delete my memories of my first 30 (or 40) years! !” Here is why: None of us knew any child or young adult who was not channeled and controlled in his life outside of school. After-school activities, restrictions, and supervisions are imposed upon all children except very rural farm children. NO child today has the freedoms we had. My instructions were only, “Be back in time for dinner!” ‘No inquiry about where I was going, whom I would be with, or what I would be doing. Cornell University was our four square mile playground for bike rides. Even a rainy Saturday could be spent running loose in Barton Hall. Nobody took issue with my pocket jackknife or even a belt-worn sheath knife. Knives were tools; it didn’t occur to us that they could be weapons. Their biggest threat was a self-inflicted cut. Today’s horrors of the social outdoors didn’t seem to exist. And we could move about and play feeling entirely safe anywhere. Just a note to bring us together in thought as we enter into summer activities. Those of you who are on Facebook are more current with what’s happening with some classmates than I am. I do have news of three classmates needing our prayers. Bonnie Kellogg Brown is on home care after cancer has spread from lungs to her brain and other areas. Her cancer has taken her through a courageous battle. She writes with such faith and is so very appreciative of her husband’s bedside care of her; also thankful for caring friends. Bonnie’s address is PO Box 21, Newfield, NY 14867. Barb Bennett is in rehab after a medical response team was called to her house and found her on the floor. A hospital stay revealed she had experienced kidney failure and had been out for 36 hours before help arrived. She is recovering now. Barbie’s address: Barbara Bennett, University Place Rehab, 1700 Lindberg Rd., West Lafayette, IN 47906. Kathleen Muzzy LaMorte is in recovery after a second shoulder surgery. It was her second try for improved mobility and her body rejected the device for treatment which has left her quite sick for a while, but she is in recovery now. Her address is 1332 Ballesteros Dr., The Villages, FL 32162. She will be headed north for the summer once she is able. If you know of others whose spirits would be lifted if they heard from us or to know we are praying for them, please let me know. Our age and our class size would tell me there are more. I am not on Facebook so I appreciate your help. Better see if they give you permission to tell us?? It would be kind, and sensitive to ask. I had a nice note from Barb Child Mobbs with a picture of her new house near Salt Lake City. She misses her home on Enfield Falls Rd but has shown courage and determination to walk a new path now. Her new address is 138 West Center Street, Spanish Fork, UT 84660. I am once again changing life styles for the summer and heading north to the farm and my tractor. My lap top and phone go with me, as well as thoughts of you. 518-421-6726. Steve Beaulieu, our Webmaster, is also heading north, and his phone number is 352-665-9780. We are both happy to receive email as well. 1. If you change your surface mail or email address, please notify us. 2. Have you given your next of kin an IHS person to contact should you fall ill or pass on? 3. 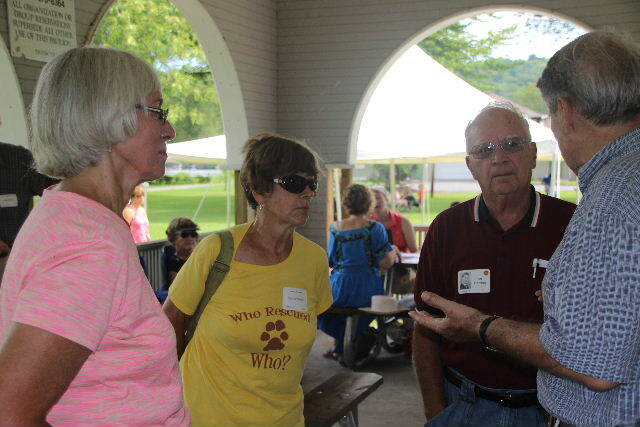 Steve is always glad to add your pictures and stories of mini gatherings to the web site. Send those to Steve at SAANYSCOR@aol. 4. Donations are always appreciated and are applied to web site costs or set aside for the planning of the next reunion. If you desire, send check payable to Phyllis Sommerman, 3245 Riverton Road, The Villages, FL 32162 or 386 Union Mills Road, Broadalbin, NY 12025. 5. If you do not have a recent directory book of classmates and would like one, send $8.50 and a mailing address to: Phyllis Sommerman, 386 Union Mills Road, Broadalbin, NY 12025. Note: a few classmates have told me they do not see certain classmates in the directory on the web site. That is not the directory I mail out. 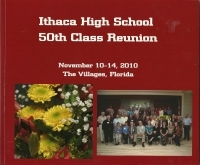 The classmates listed on the website www.ithaca1960.com are only those who have kindly submitted a profile. We would love to have a profile for everyone. If you feel uncomfortable creating this profile let me help. Send me what you would like to tell us and I will enter it for you. If you proceed on your own, please date your entry; and a revised date if the earlier profile is out of date. With our best regards, we stay connected to you. Next reunion will be our 60th! Can you imagine? "Just wanted to signal my appreciation and admiration for the features on “our” website. One idle and uninformed question: I wonder if some listing of current retirement hobbies on the site might spark a few semi-random e-traffic. I have two such: one is fostering research on the origins of baseball, which involves my website at Protoball.org and work with the SABR baseball research group. The other is pretty obscure, and involves trying to figure out how our most dramatically-successful technology sectors (air carrier safety, cardiology, car safety, etc.) actually got that way. I enjoyed gazing at the 75th photos; Alexa and I were in Stockholm then – a great summer destination." "I had already been to my infectious disease doctor this morning. She gave me the green light to proceed with the hip replacement surgery which, in turn, will stop the horrible ten months pain in my leg. The skies cleared. The sun came out. Judy was at another doctor appointment. Mary Werner, our neighbor, put me up to it. I dropped the top and she snapped the photos. The temperature was 65. How could I resist?" Ron W.
"Many thanks for the update and your incredible diligence and love in maintaining the Class of '60 bonds. I was saddened to learn about the loss of Anne and Barbara, as with all classmates who have passed over the years. The "Deceased Classmates" page makes for a bittersweet visit to the website. City life is a bit of a shock for this country mouse. Sirens and lights all night, almost permanently gridlocked traffic on the streets. The diverse ethnicity is nice though as is the variety of food and cultural events. And of course having family as neighbors. I seldom use my car preferring my bicycle for almost all errands (3,800 miles since last June) despite the pucker factor in the narrow bike lanes. Hangar space being scarce and crazy expensive in Seattle I had to leave my little airplane toy in Yakima where it's up for sale. As a (poor) substitute I set up a flight simulator in the spare bedroom where I can make brrmmmbrrmmm sounds. I continue to write and have some poems in a few Seattle and regional anthologies. I'll be sending a check as a donation and for a current directory. Attached is a photo take at the log home last winter when my granddaughters visited for some snowshoeing. " After a few months my oncologist declared my cancer in remission, saying it was "remarkable" and to "keep doing what you're doing.". Certainly we could consider intermittent therapy. You do have a very aggressive cancer, successfully controlled, so we would have to be very careful. ... Note: it may take 6 - 12 months for testosterone to rise." I hope our classmates can use my n=1 experiment, but they should expect only negative reactions, sometimes very emotional, from their doctors and dietitians. The best you will probably get, as did I, is "keep doing what you're doing." The season demands a greeting be sent to you! What a perfect time of year to connect through an email or FB or our website www.ithaca1960.com. Picture us gathered ‘round the fire, laughing, remembering when, and caring. This message comes with that experience in mind. Alexa just moved in to my household. It’s nice when you live alone to say good night to someone and hear a sweet response. But she doesn’t seem to know about our class. She doesn’t tell me how you are doing. I can only pray every day that you are covered in protective and encouraging fleece, assured that others care about you. Strolling through the last quarter of our lives, we travel with memories of good times we have shared, and the peace of knowing we will be carried when needed by those who understand and share the challenges before us in this stage of life. When I have the honor of passing along to you the news of another classmate’s passing, I offer us a moment to give our thoughts over to how this classmate has been part of our lives, and thank them for the memories. Each time we say good-bye, it adds strength to the bond remaining, and deepens our connectivity, our desire to stay in touch. Naturally, my circles have kept me more current with some of you, as has been your case. Please know that for the rest of you, you are not forgotten, and you are not just a name in a list. I have my directory on the coffee table. Know that I ponder over the pages, name by individual name. You are each important to the rest of us. I rose early this morning and took one of those strolls on the boardwalk at Lake Sumter. 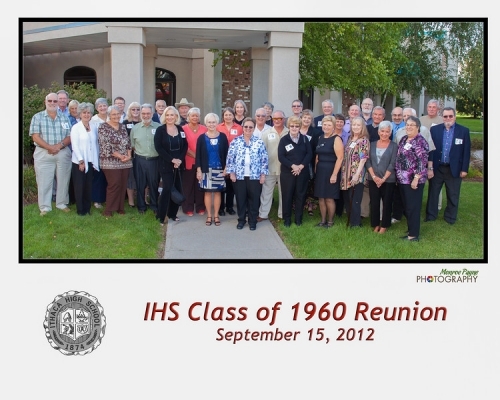 For those who were able to attend the 50th reunion here in Florida, I took a few pictures. The white pelicans arrived at sunrise. The lobby of The Waterfront Inn, our temporary home, is quite festive, hurricane flooding has subsided and today is 78 and sunny. ​Back Rows: (left to right-staggered) Dave Sears, Steve Beaulieu, George Damp, Joe Scaglione, Nancy Hubbell, Ben Adams, Nancy Cladel, Steve Stephenson, Beverly Brink, John Osborn, Bob Townsend, Bill Gordon, Janice Murphy, Richard Owlett, Terry Hilker, Robert Gray, Dave Wilson, Robin Alexander, Dean Melville, Alan Simons. ​These were the picnic attendees. Others joined us for the various weekend activities but were not able to attend the picnic where the class photo was taken. Classmate Peggy Payne's professional photographer brother, Monroe, took this picture. Phyllis sent out ordering information if you'd like your own close-up copy of this. There's also a copy that includes spouses and significant others. The excellent 75th Birthday Bash cake. ​Thanks to some of our volunteer class photographers Richard Owlett, Dave Wilson, Phyllis McLaren Sommerman and Steve Beaulieu, we will have started sharing their contributions on this website and our class Facebook page. These are by no means all inclusive, but will serve as a start as we document our 75th Birthday Bash, held back in August. ​In the "Class Photo Albums" section of this website, we will try and arrange the photos by events. As new photos come in from other classmates we'll add to these photo albums. Check back often, because these take awhile to upload and position. ​The event were: Thursday at the Ciao! restaurant, Cornell Ornithology School (Sapsucker Woods), Moosewood Luncheon and old building tour, The Rose, Tremen State Park hike, class picnic at Upper Buttermilk Falls State Park and Sunday brunch at the Ithaca Ramada. Labeling: In anticipation of the usual " Who are these people?" questions, Al Simon and Steve Beaulieu will attempt to label as time permits. Sixty two classmates have joined the newly created, closed group on Facebook. Check it out and join us. Your input, as always, is welcome. Royce Jan Murphy, Martin Wright, Dan Wallenbeck, Patricia Newman, Ollie Detweiler Arnie Hammer, David Spencer, Peggy Hertel, Al Simons, Bill Gordon, Jinny Klune, Phil Ewanicki, Tom Vormwald, Dorothy Van Order, Shari Grover (updated March 2015), Ed Knaysi, Liz Horn, Bob Gray, Suzie Hough, Keith Bruckner, Phyllis McLaren (updated June 2017),Terry Cullen, Bernie Cook,Terry Hilker (updated June 2017) Judy Mitchell, Bill Lester, Kenna Grant, David Meldrum, Barry Smith, Alison MacLeod , Mary Avery, Gigi Greenwood, JB Graves (updated JUNE 2015), Dave Wilson, Kathy Hull, Carolyn Fallon, Ed Thorsland (updated June 2015), Alan Westfall, Karen Dann, Ernie Falke, Katie Detweiler, Barbara Darling, Don Berk (updated February 2018), Sandy Cornelius, Dorothy Griffith, Doug Hughes, Dave Goode, Leo Johnson, Larry McCray, Elaine Tutton, Ed Shea, Virginia Hixon, Marilyn Dropkin, Marilyn Trapp, Ron Winchell and Steve Beaulieu in posting their profiles on this website. Do you miss seeing some of your friends listed here? Encourage them to post now. Is your's here yet? Now would be a great time to let your classmates know what is new with you. Lining up for class photographs that Monroe Payne took. Back row: Eddie Knaysi, Bill Gordon, Jim Wells, Rob York, Don Enright, Virginia Klune, Dorothy Griffith, John Osborn, George Damp, Phil Ewanicki, Miss Chips. 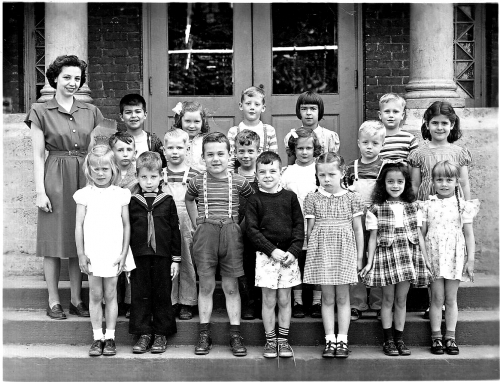 Middle row: Virginia Hixon, Marilyn Dropkin, Janice Murphy, Allison MacLeod, Karen Ross, Phyllis McLaren, Marybelle Avery, Bonnie Gay, Carolyn Fallon, Wincie Hanneson, Celia Lawrence, Joan Kendall. Front row: Mike Lawrence, Terry Cullen, Alan Mack, Robin Williams, Bob Seager. Here's what we have so far: 3rd row, far right--Richard Owlett; 2nd row, far right--Amelia Stratakos; Front row, third from the left--David Drier (moved out of district prior to high school), second from right--Claire Hernaez. 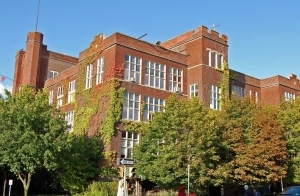 The old high school building, known today as DeWitt Mall, is currently used for retail businesses, offices and apartments.